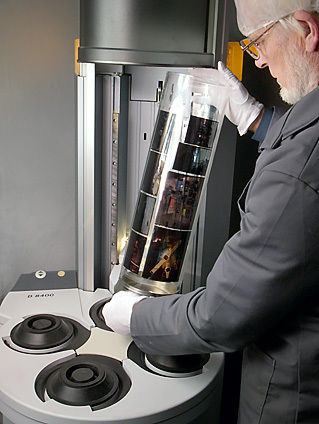 Negative & colour transparency film drum scans with Heidelberg Primescan by Precision Drum Scanning. make, type and size of negative and colour transparency material. will do our utmost to rescue the situation for you. aim to match the film. All scans are made in 16bit without USM. being blown off with filtered anti-static compressed air. a safe specially designed liquid possessing superior optical qualities. This cover sheet is then securely fastened to the drum with tape. an hour for the actual scanning operation. Click to read more about drum scanning. Placing a drum loaded with colour transparencies into one of our Heidelberg PrimeScan drum scanners.